Papa Louie is the name of a famous pizza chef. One day, Papa Louie asked the maid to give the cake to the customer. But all the cookies he made that day turned into monsters. 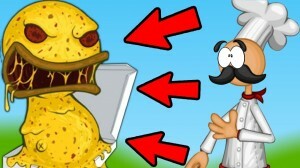 Your task is to hit the obstacles that pizza puff to hit the cake to get it back to the box. How to play Papa louie? Press DOWN ARROW to pick up the cake. At the end of the path, jump on the crane to rescue your friends and complete the level.